WHAT'S IN THE DNA OF THE FERRARI 488 SPIDER? 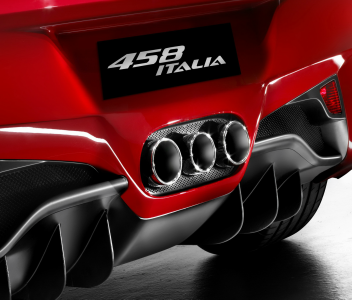 Let’s address the most eye-catching obvious – that the inspiration for the Spider’s design is the Italia 458. Now, while the Ferrari 488 Spider is a gorgeous beast whatever way you look at her, her outstanding quality is definitely a stone-cold killer ability to scythe through the air with a fluid, omniscient confidence. Extreme Racing Style all the way and incredibly fun to handle. From the moment you rev the engine for the first time, you're in love. 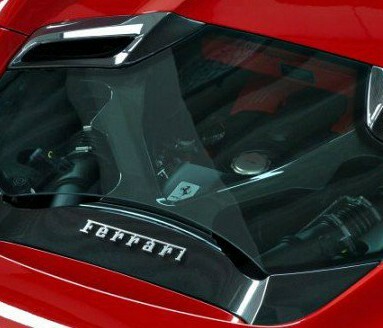 After all, who doesn't want to drive a Ferrari? Modestly described as an effortless marriage of technology, design and beauty, the Ferrari 488 Spider is also a trailblazer, the first to combine a mid-rear engine with a retractable folding hardtop, while still delivering unparalleled Spider performance. The 458 Italia remains an all-time design classic and the 488 Spider sees the bodywork panels redesigned but without modifying either the passenger cell or the stand-out design features of the iconic Italia. 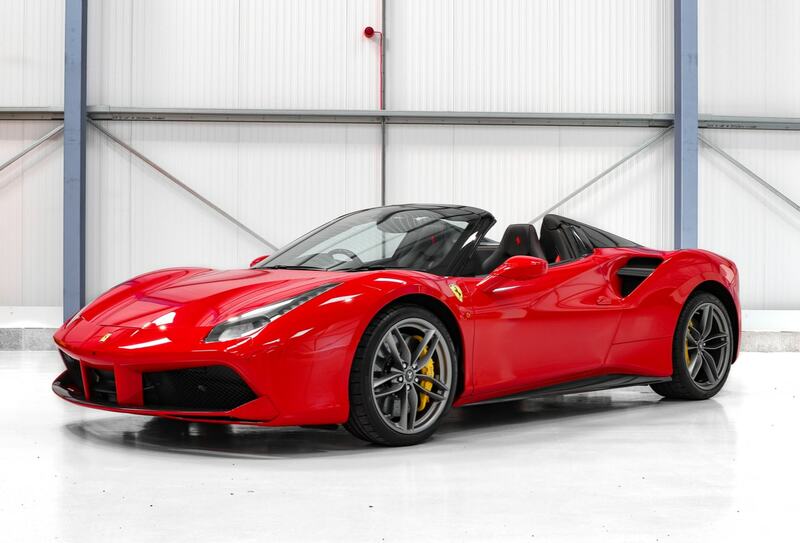 Whilst its predecessor had the white and blue central stripe inspired by the historic NART (North America Racing Team) livery, the Ferrari 488 Spider is in the traditional Ferrari red. 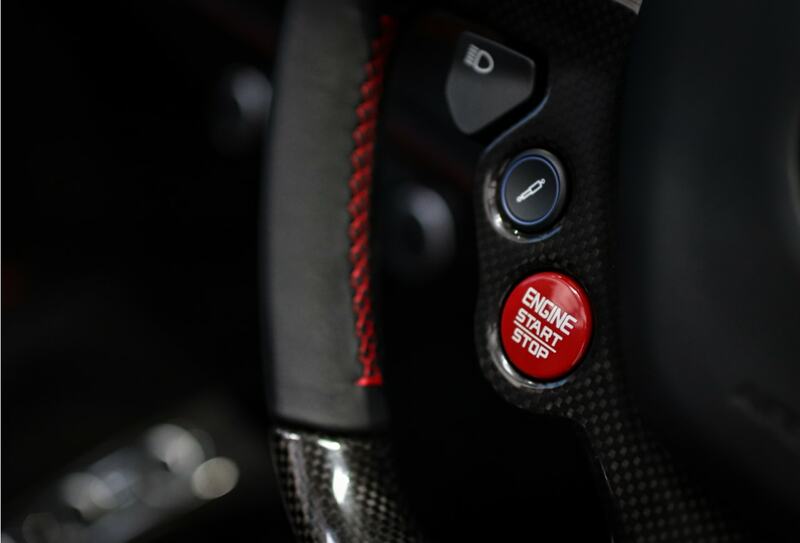 Slide into the cockpit of the Ferrari 488 Spider and let your senses appreciate the elegant, leather-trimmed carbon fibre dash complete with retro air vents, sensible, centrally situated tachometer and F1-inspired steering wheel conveniently studded with everything a driver could need, including ignition button, wipers, hooters, indicator switches and lush series of red (what else) LEDs that illuminate sequentially as the engine nears redline. 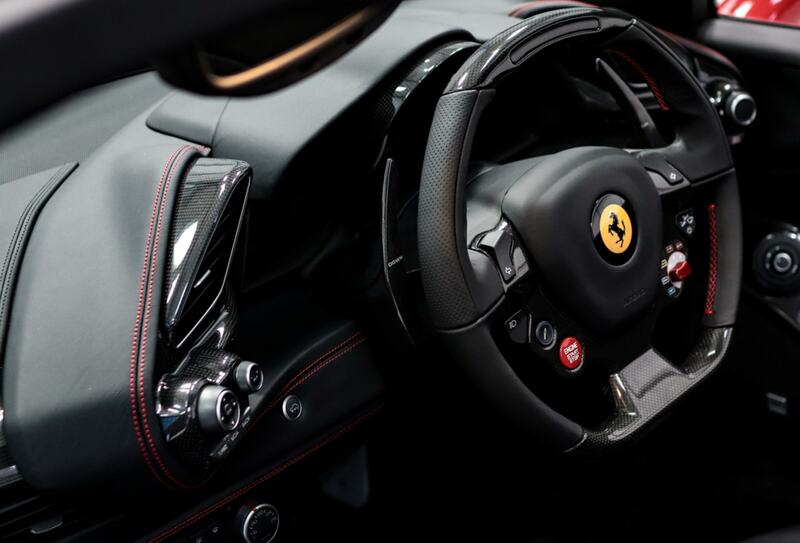 Seats are ultra cushy carbon fibre buckets wrapped in Alcantara leather and the centrepiece de resistance is the roof switch in the centre console that transforms the 488 Spider from heavyweight hardtop into an open-air roadster in just 14 super-satisfying seconds. 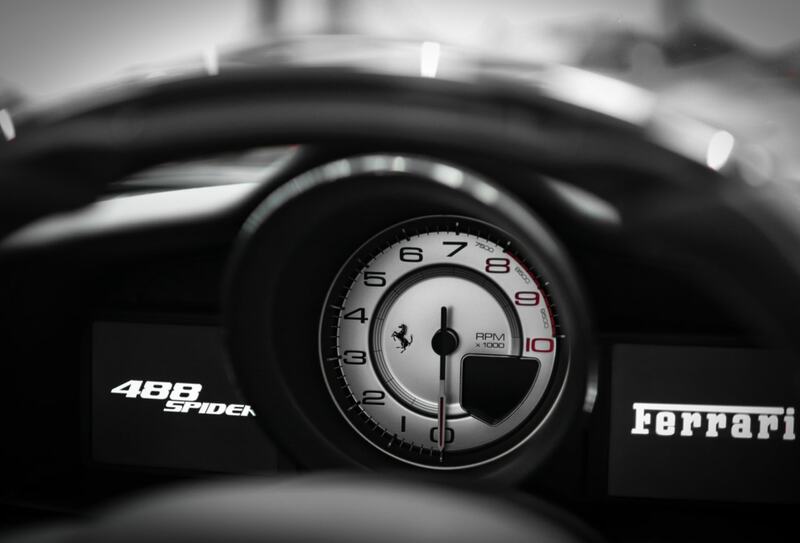 Step into the Ferrari 488 Spider, the most beautiful time machine ever built. Intimately encircle yourself in advanced technology designed to be an extension of your body, hood up or down. Feel the concept of time blur as 660 bhp transports you over 75 metres in 3.0 seconds, from a standing start to a shimmering red mirage of pure speed. 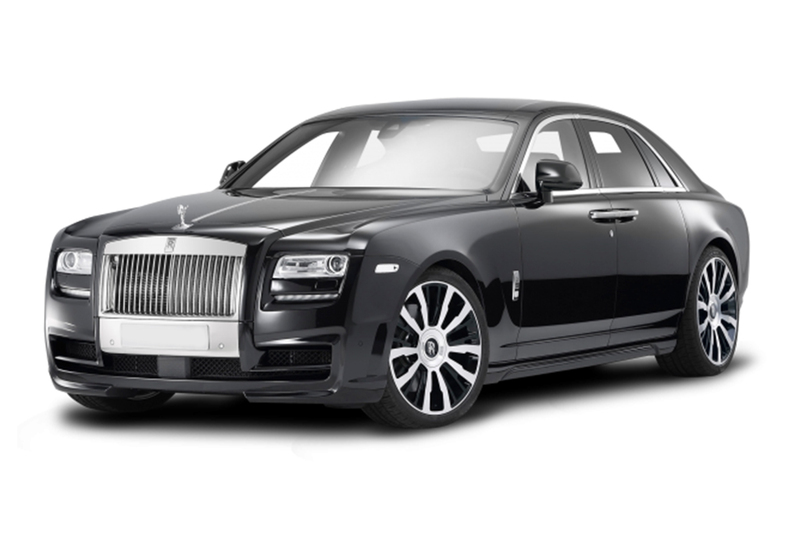 It's a pleasure to drive the V8 engine as it's built to celebrate the joy of driving. So jump behind the steering wheel and rev the twin-turbo engine. 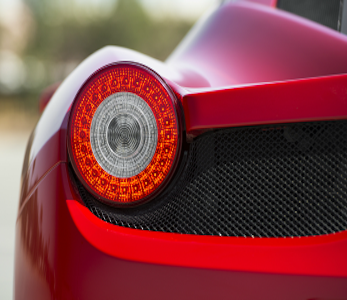 So what stands out about the 488 Spider, technically speaking? It’s quite simple. 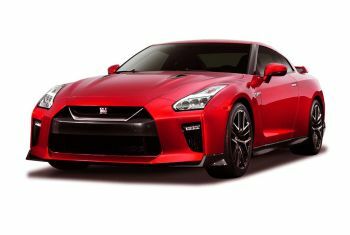 When you have 660 horsepower at 9,000 rpm pushing 2,843 lbs of dry weight, it means you get to 60 miles in three seconds and to 124 mph in just over nine. That’s better than the McLaren P1. 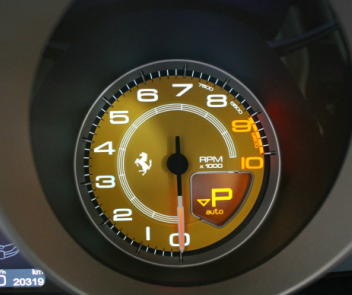 And that’s why the 488 Spider is the king of the speed demons. The distinctive, racing-inspired look and feel is everywhere. 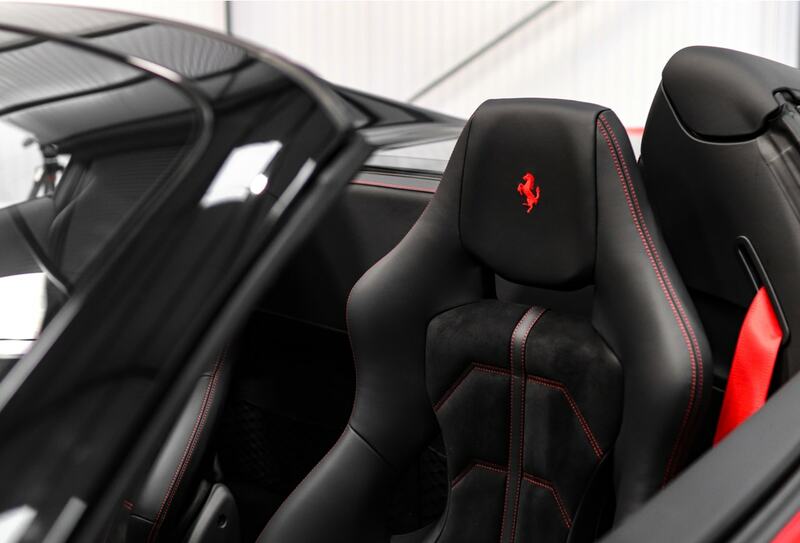 Alcantara and carbon-fibre: moulded, hand-stitched and fitted with the craft and sophistication typical of all Ferrari interiors. 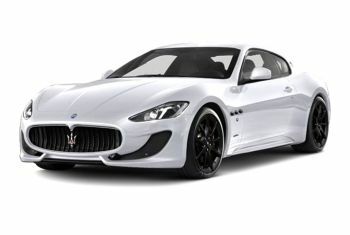 Speaks the same aesthetic language as the 458 Italia, just with a lot more ‘colour’. With the highest power-to-weight ratio (135 cv/l) for a road-going Ferrari (also a world record for a naturally aspirated road-going engine) and an ability to punch out 605 cv at 9,000 rpm makes this the most powerful naturally aspirated V8 engine ever built at Maranello. Throwing out yet another superlative is the 488 Spider’s exceptional aerodynamic efficiency. 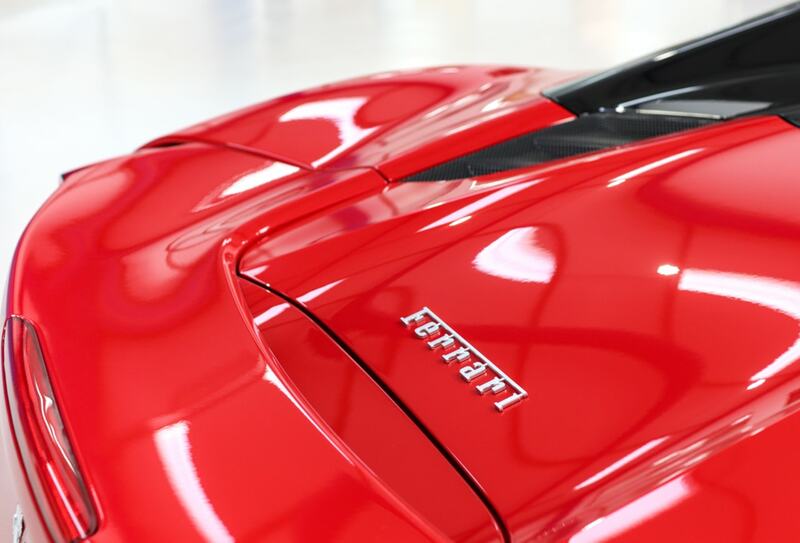 At 1.5, its coefficient is the highest in Ferrari production car history, a testament to the innovation and vision that is lavished upon this marque. Steering response time of 0.06 seconds. . . Lateral acceleration of 1.33 g. . . 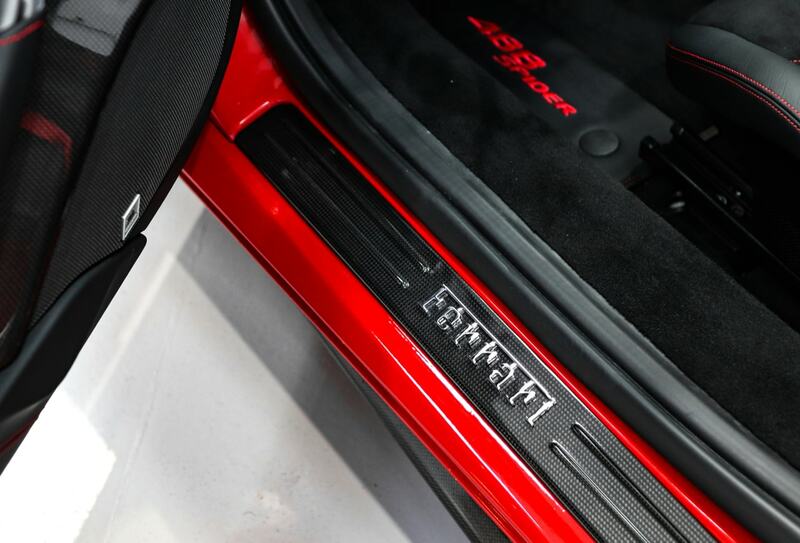 Both these scores are the highest ever achieved for a Ferrari production car, just a couple more dynamite dynamics to impress even the most performance-oriented drivers. One of the most compelling and memorable characteristics of the 488 is the sweet soundtrack from the V8 engine. Give it a play in the natural echo chamber of Cheddar Gorge or downshift through tunnels with the top down for one of Marinello's most sublime surround sound compositions. 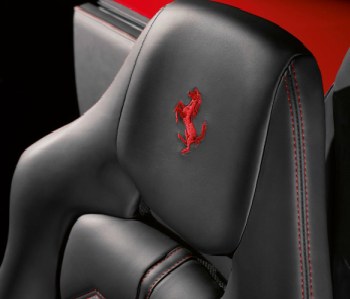 All the seats are made by Sabelt and feature carbon-fibre shells and ergonomic side bolstering. A breathable 3D fabric is used to pad backrests and seats, allowing for optimum air circulation and increased driving comfort.